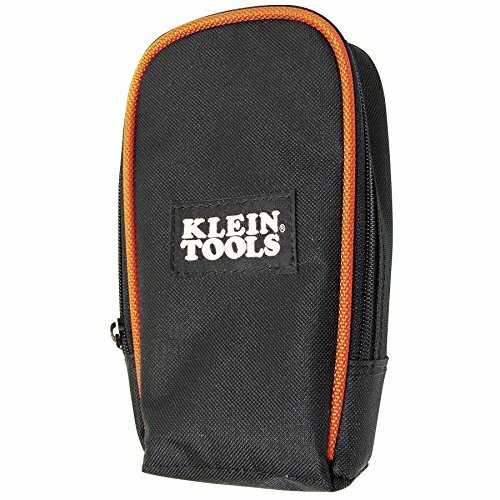 The Klein Tools Multimeter Carrying Case is part of a full line of test and measurement products designed from the ground up by electricians for electricians. The case has exceptional resistance to abrasions, punctures and tears. This heavy-duty carrying case offers convenient storage for CL100, CL200, CL1000, CL2000, CL3000, MM100, MM200, MM1000, MM2000, ET50, ET100 and ET200 test and measurement products.It can also hold Klein's Electronic Voltage Testers. Convenient storage for meters, testers and tools. 6000-denier nylon construction for durability. Heavy-duty PVC zipper closes securely. Carrying case offers convenient storage for CL100, CL200, CL1000, CL2000, CL3000, MM100, MM200, MM1000, MM2000, ET50, ET100 and ET200 test and measurement products. Also easily fits the following Klein test and measurement meters: MM300, MM400, MM600, MM700, CL110, CL210, CL310, CL600, CL700, CL800. Part of a full line of test and measurement products designed from the ground up by electricians for electricians. For more than 160 years, Klein Tools has manufactured premium-quality, professional-grade hand tools that deliver the performance, durability and precision needed to get the job done right. Our family of engineers, workers and craftsman continue to put six generations of expertise into every tool we create by using only the highest quality materials, superior workmanship, and keeping manufacturing as close to home as we can. Klein isn't just the name of our company, it's also our family name. And since we're an American company that's family-owned and family-run, you know you can count on us to be here tomorrow. Klein Tools doesn't just make great products, we make great products that stand up to the demands of the professionals who use them every day ... Since 1857.